Already the fourth fan interview, this time with super fan from Sweden: Martina. We met Martina at Tina’s concert in Arnhem in 2009 and also at several fan parties and we were curious to hear her Tina memories! Martina is 29 years old and works as a web editor for the Eskilstuna municipality. She has been a Tina Turner fan all her life and was kind enough to share some of her stories with us! When did you discover Tina? The first memory I have of Tina is when I saw the cover of the European Private Dancer album. I could’ve been around five years old. I thought she was the coolest woman I’d ever seen. I wanted to be just like her. My parents had a lot of records and especially my dad is very into rock music. They even went to her concert in 1984. They liked her a lot too. Not like I do, but they’ve been very supportive of me idolizing Tina. What was the first thing that attracted you to Tina? Her image, charisma and her voice above all. Also, I think it was the fact that she didn’t look like anyone I’ve seen and I didn’t either, so I think I related to her in some kind of way. She is a role model for you? Yes. When I found out about her life story and I started reading interviews with her, I discovered what kind of person I wanted to be. Not saying that I wanted to be Tina. But I saw how I wanted to be as a person and how I wanted to deal with things in life. So she’s been a great inspiration in that way! When did you first go to a Tina concert? At that time, I was in 7th grade. So I was around 13 years old. I was doing an essay in school for music class and I wrote about Tina. That’s when I got somewhat obsessed. And then I found out that she was doing a tour that year so I begged on my knees for my parents to take me and so they did. So I saw her for the first time in 1996 and after that I was hooked. She did several shows in Stockholm, but they were already sold out when I found out she was coming. But then she added an extra show in Gothenburg with 56.000 people in the audience. That was the first time I saw her live! Yes, I saw her twice in 2000 and and seven times on her 2008/2009 tour. For that last tour, I went to Newark, London, Stockholm and Arnhem. What was it like seeing her in the United States? The audience is not at all like the European one. They are more calm and even shouting at people for standing up. But they liked Proud Mary, everyone was standing for that one. The concert in Newark was on her birthday, and everything that could go wrong went wrong. There were some sound problems and in the end she didn’t perform the last song of the show. Foreign Affair and her 50th Anniversary tour. Unfortunately, I didn’t have the chance to see her on her Foreign Affair tour, so for all the personal memories I would say her 2008/2009 tour. I liked the intimacy and Tina was more personal on this tour than she was when I saw her in 1996 and 2000. And I liked this set of dancers. The setlists hardly changes but I liked that she brought back Typical Male and What You Get Is What You See. I missed her singing with the audience though. What are your fondest memories of Tina? In 2000, I first went to see her in Denmark and I brought this huge banner that I’d made myself and she noticed it. Then two days later I saw her in Gothenburg and she spotted me in the audience again and pointed at the banner and made thumbs up. Then when she went down to the audience to sing with us she rushed up to me, so I got to sing with her! Another memory that stayed with me was one of the concerts in London in 2009. When she started to sing Let’s Stay Together the whole audience started to sing with her and they sang so loud that Tina stopped singing and it looked like she was about to cry. That was a very touching moment. And what is the craziest thing you ever did as a Tina fan? Well, I just want to point out that I am not proud of this next story and I am still ashamed. Tina, please forgive me! It was in 1998 and Tina was a guest star at Eros Ramazzotti’s concert in Munich. I begged my parents (again) to take a detour on our vacation in France to go there. Eros performed on some kind of huge lawn. It was an open air concert. There were seats but I didn’t care; I stood on the side of the stage with some crazy Eros fans. Tina sang her two songs and then went off stage. I saw that you could actually go behind the stage. So I did. Behind the stage there were these tall fences keeping people from actually walking backstage, but you could still see everything that was going on behind there. I waited and thought that I’d missed Tina when suddenly she walked down from the stairs behind the stage with lifeguards on each side of her. She had a cardigan thrown over her shoulders and she looked very regal. Out of nowhere I hear myself scream “TIIIINAAAA!”. And Tina got so scared she almost jumped up in the air! She put her hand on her chest and made this very dramatic look of “What the h*ll was that?” And then she turned and looked at me. Not pleased at all! I rushed up to the fence and asked for her autograph. But she just looked at me, shook her head and said “No” and ran to her car. Two security men came up to me and dragged me away from there. You didn’t meet her besides that experience? No, unfortunately not. 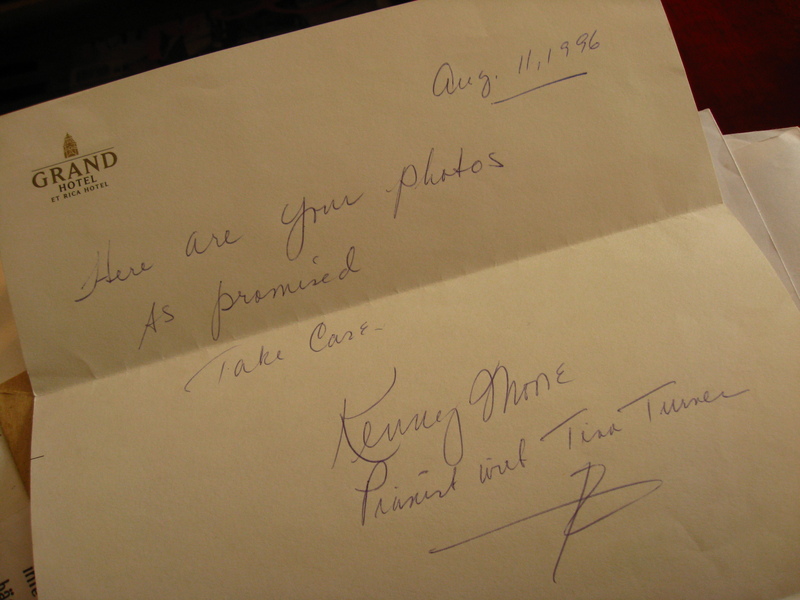 But I did get to meet Kenny Moore (Tina’s long-time pianist that passed away in 1997) in 1996, I’m very grateful for that. It was the morning after the concert in Gothenburg and me and my parents were walking past a hotel, and Tina’s band was staying there. There was a tour bus waiting outside. So we waited and the band came out. I got autographs from most of them. My father actually ran inside a book store nearby and bought an envelope and wrote my address on it. He gave it to me and said that I should give it to Kenny and ask if he could send me Tina’s autograph. But Kenny was already in the bus and I was nervous to go in there, but my dad persuaded me to do it. So I stepped in the bus. I handed the envelope to Kenny and he was nice enough to send Tina’s autograph to me from Oslo! Christian is a good friend of me, we became friends through Tina. We met online at a chat room for Swedish Tina fans. Christian and I both love to travel and to go to concerts so we’ve been to quite a few now. He’s the bestest travel buddy ever! I’ve met some truly wonderful people by being a fan of Tina. People I never would have met if it wasn’t for Tina so I have to thank her for that too. It has become almost like a little family. And when we all meet it’s like the UN of Tina fans. I love it! And how do other people react to you being such a big Tina fan? My real friends have always been cool with it even though they probably at times find it strange and weird. And now when I’m grown up most people think it’s cool even though they don’t always understand it. But when I was a teenager a lot of people at school were really nasty to me. BRUUUUUCE! I’ve grown up with Bruce Springsteen’s music. I was three years old at my first Bruce concert: I love his concerts. But I like all kinds of music. I listen to a lot of different genres and I am constantly looking for new music to listen to! I sure hope so! But I wish she does something different. A more toned down tour with just her, the band and her voice! Thnx martina and thnx sjef and ben .. ! Great interview. 🙂 That was really nice to read! Nice interview, always nice to read other Tina Fans stories!! Yes Fiona, you should join us some time! It looks like it will be Amsterdam again for Tina’s birthday this year! yes Fioners! We need you!! интерьеру и расстановке мебели в квартире. как она будет смотреться в вашем доме.